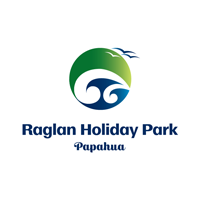 Raglan Holiday Park is a great base for your Raglan holiday of surfing, fishing, or just plain relaxing. Our Kitchen Cabin’s have a separate bedroom with one double and one single bed, and one set of single bunks. For your alfresco dining there is a covered outdoor eating area. All of our Raglan camping ground facilities are close by should you need them – toilet, shower, laundry and games room. And with the beach, playground, skate park and Raglan Township only a few minutes walk away what more could you want. Each Kitchen Cabin contains a TV, stove, microwave, fridge, pots and pans, cutlery, crockery, jug and toaster.